Yokozuna Kisenosato tasted his first defeat of the Autumn Grand Sumo Tournament on Friday, losing in an upset to No. 2 maegashira Chiyotairyu. 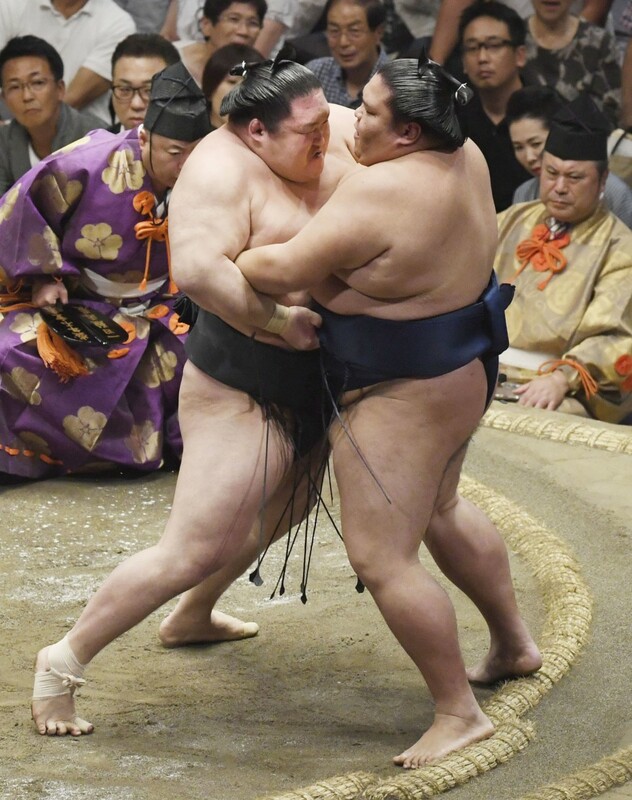 The other two grand champions, Hakuho and Kakuryu, remained undefeated, while ozeki Takayasu also maintained a perfect record on the sixth day of the 15-day tournament at Ryogoku Kokugikan. Seeking a quick result following a run of energy-sapping victories, Japanese grand champion Kisenosato charged his opponent from the jump in the final bout of the day. 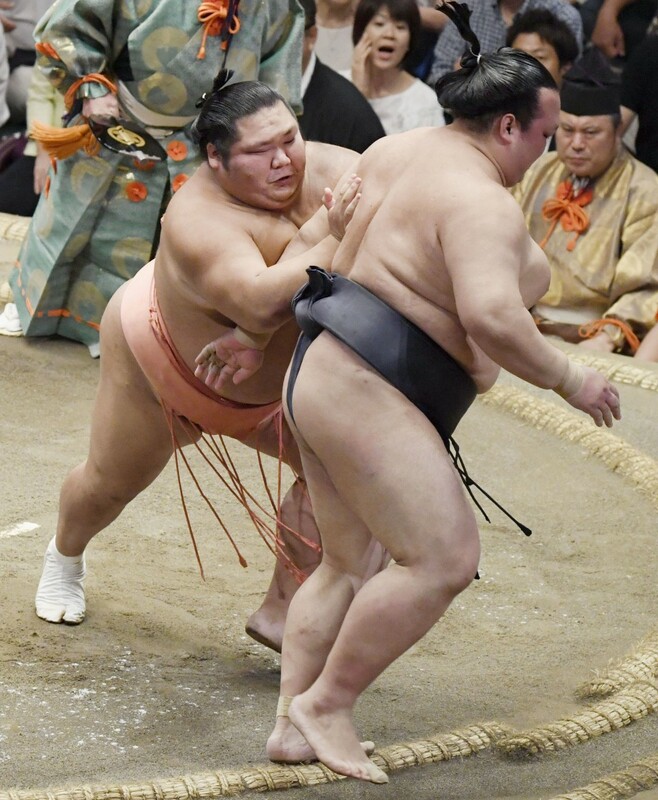 Chiyotairyu (1-5) sidestepped the yokozuna, however, slipping to his left before pushing him out. Hakuho beat No. 3 Shodai (2-4) after judges reversed an initial ruling handing the bout to the maegashira. Having taken an inside grip at the jump, the Mongolian grand champion drove Shodai to the edge of the straw before being toppled with a last-ditch overarm throw. After conferring in the center, the officials determined Shodai's heel touched outside the ring while initiating the throw. All-time championship record-holder Hakuho has won at least one tournament for the past 12 years, but has yet to claim a title in 2018. Kakuryu continued to look the most impressive among the three yokozuna in his thrust-out victory over komusubi Tamawashi (0-6). After having his grip attempt deflected, the Mongolian grand champion used his quick hands and lower body strength to drive his compatriot out backward. Takayasu put on a powerful display against No. 1 maegashira Kaisei. The ozeki hit his Brazilian-born opponent hard with an opening shoulder charge, then countered an attempted throw before forcing him out. Sekiwake Mitakeumi, winner of the previous tournament in Nagoya, suffered his first loss of the meet against ozeki Goeido (5-1). The ozeki drove Mitakeumi back from the jump, but the sekiwake dug in to halt his forward momentum. As both wrestlers gripped each other's belt, Goeido dropped his hips low and bulldozed his way to the win. A day after being manhandled by Mitakeumi, ozeki Tochinoshin (4-2) bounced back with a decisive win over No. 1 Ikioi (0-6). Sporting a black eye courtesy of his Day 4 bout against Tamawashi, the powerfully built Georgian slipped to the side of the charging Ikioi and slapped him to the clay. Komusubi Takakeisho (2-4) scored an impressive win over sekiwake Ichinojo (2-4). Facing a 57-kilogram weight disadvantage against the biggest man in the division, Takakeisho jumped quickly out of the blocks, pushing and thrusting at Ichinojo, who was unable to secure a grip and stepped out backwards. Though Takakeisho has only two wins, both have come against top-ranked opponents. He beat Tochinoshin on Day 3. No. 15 Yoshikaze (5-1) suffered his first loss of the meet against No. 13 Ryuden (5-1), leaving ninth-ranked Hokutofuji as the only undefeated rank-and-file wrestler following his win over No. 7 Tochiozan (2-4).